Quality home care requires the inclusion of the elderly person’s entire support system–it must be family-centered. In order to meet the needs of the senior the care plan should include the thoughts, perceptions and needs of the family members. Unfortunately, too often, family caregivers’ needs and their insights are overlooked in the implementation of home care. There are 44 million unpaid elder caregivers in the United States, that’s one out of every six adults. It’s a staggering statistic, one that makes the family caregiver suddenly realize that they are not alone in the overwhelming struggle and honor of caring for a loved one. And for those not caring for an aging loved one, you may look around and suddenly see the care responsibilities of your friends and family members in a different way. The family caregiver has first hand knowledge of the care needs of their senior loved one. Even individuals with limited health care background quickly become knowledgeable on medications, medicare coverage, chronic illness, and the specific ways to care for their loved ones. Society of Certified Senior Advisors recommends a caregiver assessment be performed to gather a more complete picture of the care needs of the elderly loved one. Not only does involving the family provide a more thorough picture of the care needs of the senior, but it sheds light on the multiple responsibilities that the family caregiver have maintained. The family caregiver is so focused on the care needs of their loved one, that they often don’t take the time to realize the impact that the care is having on their own health and well-being. Caregiver stress is pushed to the side, and the family caregiver trudges forward. But, your health matters too. How long have you been caring for your loved one? How many hours a day do you provide care? What is the most difficult parts of caregiving for you? Which tasks to you do to care for your loved one? What health issues do you have that affect your caregiving? When was the last time you went to the doctor? How involved is the rest of the family in your loved one’s care? Who steps in when you are sick or need a break? What other responsibilities do you have outside of caregiving (work, children, etc.)? These questions provide not only information about the care needs of the elderly person, but it reveals the impact of those care needs on the care family caregiver. 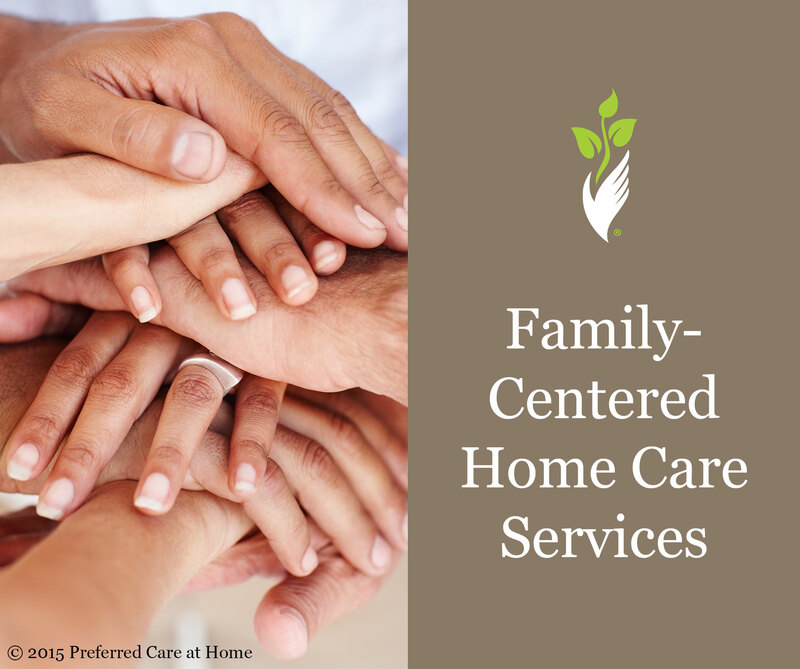 At Preferred Care at Home we believe that quality care should be family-centered. The right home care team doesn’t eliminate family, it supports family. How can Preferred Care at Home support your family?